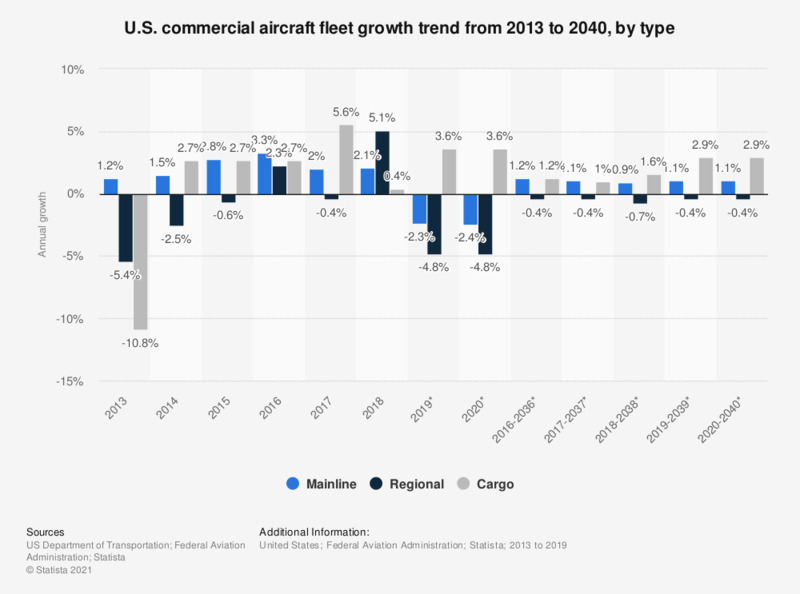 This statistic represents the annual growth of the U.S. commercial aircraft fleet from 2012 to 2018, broken down by type. In the mainline segment, the U.S. commercial aircraft fleet increased by around 2.1 percent in 2017, compared with 2016. * Data was taken from previous editions. ** The values for 2018 through 2036 are projections and were calculated as the compound annual growth rate. The growth rates are Statista calculations, based on the figures provided by the report; the values have been rounded. Everything On "Air transportation" in One Document: Edited and Divided into Handy Chapters. Including Detailed References. Business aviation market in the U.S.